Building a website has never been fun and easier with the existence of quality web hosting providers. One of them is iPage. iPage is, without a doubt, one of the best and most trusted sources of top-notch web hosting services. It’s one of the top 10 web hosting companies according to various web hosting review websites. Gaining thousands of loyal subscribers and hosting millions of different websites, iPage graces the top spot in providing quality yet affordable web hosting solutions. What sets iPage apart from the competition is that they offer high-quality web hosting packages at affordable prices. What’s more, they offer regular sales promotions and discounts that could help you save a lot of cash on web hosting costs. Right now, they have a special introductory offer of $2.75/month, which is 80% off from its standard price of $8.99/month! This gives you approximately $7/month of savings. Considering the price ranges of web hosting plans online, iPage’s offer is one of the most affordable there is – if not the cheapest. Apart from this, you can save more cash by looking for coupon codes or special discount links that will give you even better discounts. Unlimited bandwidth and disk space. This means that you will have the chance to put on as much content as you need for your website. Your space in the Web is very important as it will be the marker of your products and services. The more space you have, the more things you can share and promote online. iPage offers one free domain upon you registration.This is given for free for one whole year. Imagine the savings that you can have under this subscription! iPage has an excellent site builder that you can use for creating and managing various elements in your site. iPage allows different applications to be incorporated on your site.This includes Joomla, Drupal, and WordPress, which will come in handy depending on the type of site that you have. Go to iPage’s homepage.You will then be able to view the available hosting plans that you can choose from to employ to your site. Click on the “Sign Up Now” button. You wouldn’t have problem finding it as it is displayed largely on the page. 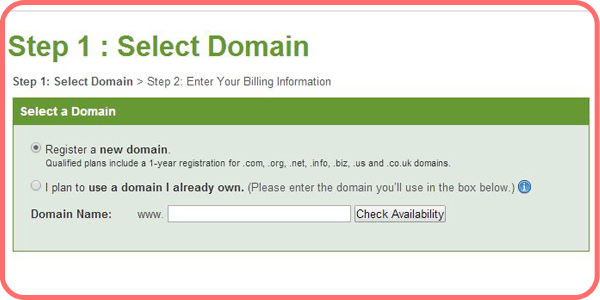 You will then be directed to a new page where you will be asked to type in a domain and check its availability. If you’re lucky enough, then it’s yours for the taking. 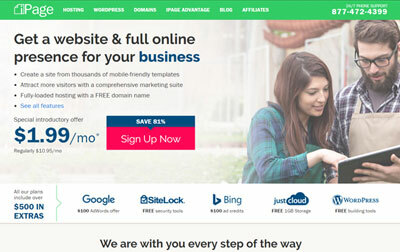 A new page will come up, you will be asked to type in a domain. This will be the name that you would want to have for your site. Its availability will be checked and if you are lucky enough that it is not yet taken by other users, then it is yours for the keeping. • Next, you need to put in your billing information on another page. You can use your PayPal account or your credit card. 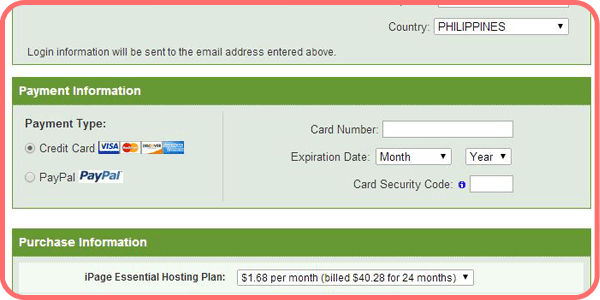 Here, you will be asked of the hosting plan that you will avail, as well as other features that you want to add on your page. • Once you’ve filled in the necessary information, you will be directed to another page, confirming your purchase. It is highly recommended that you print or save a copy of it as the information within it might come in handy in the future. A confirmation mail will also be sent to your email.